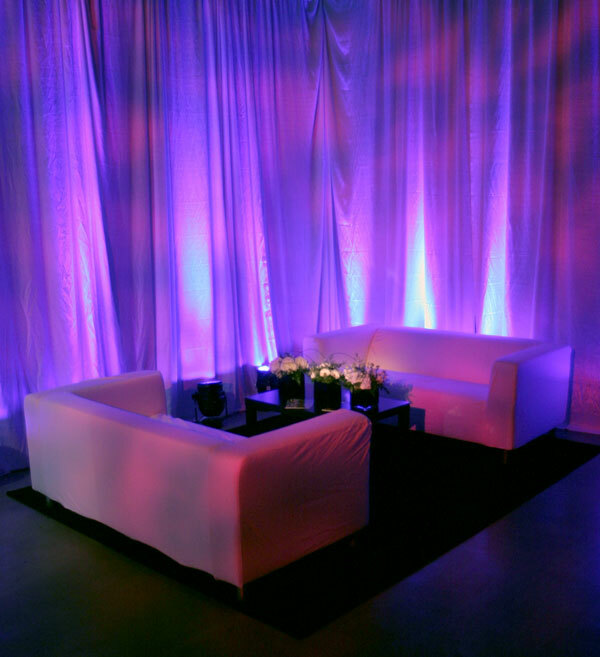 Couches, Draping and Lighting.. oh, my! CJC Event Lighting has couches, 13 foot high draping and tables to bring your event to an even higher level! The photo below is our booth at the Western New England Spring Bridal Show where we showcased our new additions. We uplit the drapery with LED pars set to 100%blue and then projected a magenta texture on the entire set. We then pinspot the floral arrangement (provided by our friends at Durocher Florist!) to tie it all together. We have 6 couches available in both White and Black.